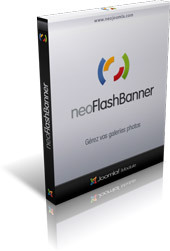 NeoFlashBanner - Flash module for Joomla! NeoFlashBanner is, just as its name indicates, a module displaying banners or pictures in a Flash slideshow. The installation of the module is carried out simply by specifying the images folder destination . NeoFlashBanner is a commercial module, it is compatible with the Joomla! 1.0.x versions. If you want to be credible to search engines, your must have backlinks towards your website. These links made by others webmasters on their sites in the section links or partners. These backlinks are largely taken into account for the final classification of your site in the search results. The tags make it possible to add a description of the page for the search engines as well as keywords for the Website. These tags are contained between the tags and are thus invisible for the visitors of your site. For all your articles, it is important to have a description and a series of keywords so that Joomla can incorporate them in META tags of the page. It is very simple to do, click on Meta Info in the right block when you are writing an article. You will be able to change them when you want.